After heavy rain Sunday evening and light rain most of the night, it’s a beautiful but cloudy day today! The hydrangea are absolutely beautiful this year! A couple weeks ago I was contact by email by about making a board. She was looking for a replacement oval cutting board insert for a sterling silver platter. She told me that she could find these platters on wedding gift website. The problem was if the board gets broken or you lose your board, you are out of luck, they do not offer a new replacement board. She said the board was used for carving meat and it had a juice groove. It was oval, 14-1/4 inches long by 9 inches wide. The underside was beveled to fit into the silver platter. After several emails with pictures, she sent me her old board, she wanted to know if I could make 4 of them exactly like her old board. The next day her old board arrived. Her old board was made from maple wood, the measurements were exactly what she had told me. I first made a template to match her old board. Once I had the template completed, I then made her 4 new boards that were exactly like her old board, handmade from hard rock maple. I shipped the boards to her and she loves them and they all fit into her silver platter perfectly! 🙂 So if you have an old board that needs repair or you need a replace board exactly the same size or wood, etc. I would be glad to make it for you! Every kitchen needs a good cutting board or serving board! If you love Caramel Pie, this is the best ever, most delicious Carmel Pie ever! The recipe for this dessert is as easy to make as it is delicious! And today is your lucky day, this recipe only includes 5 ingredients but only two to make the pie, the others are garnishes and are optional! Most copycat recipes call for 2 cans of Eagle Brand Sweetened Condensed Milk but I use three so that the pie shell is completely full. If you have never made this pie, you won’t believe step one. Remove the labels from the Eagle Brand Milk cans, DO NOT OPEN the cans. Step two is to get your large pot, add water nearly to the top, then add the cans to the water. Place the pot on the stove on high for boiling the water. The Eagle Brand Milk cans need to boil for 3 hours. VERY IMPORTANT: During the boiling process, water will quickly evaporate from the pot, be sure to add water often during the process so that the cans are always covered. I had to add water about ever 25 minutes. Be sure that the cans are always covered with water, cans have been known to explode if the cans are not kept covered with water. Now, go find something to do while your Eagle Brand Milk is turning into the most creamy, decadent and rich caramel sauce you have ever tasted! In about an hour, remove the tops of the cans, be very careful, the caramel will still be extremely hot and can burn you. Pour the caramel into the pie crust and smooth out carefully to not break the crust with a spoon or spatula. Place your pie into the refrigerator on a wire rack and let it chill for about two hours. DO not add the Reddi-wip until the pie is completely cold! We add the Reddi-wip to each slice as we cut the pie. Once the pie is completely cooled, cut a slice, top with Reddi-wip, then garnish with a few chopped pecans and mini chocolate chip morsels! Or you can eat it plain too. I am now ready to eat, it’s so easy to make and very delicious! Be sure to check out my dessert recipes! Our grape vines are loaded with grapes again this year. Everyone in our family enjoys eating grapes including our two year old grandsons. All the grapes I grow are seedling, so far I have Mars, Neptune and Red Flame. All of these are seedless table grapes. All of these grapes are very sweet, Mars is a slip skin grape. While at the beach we had deer eat a good many of the grapes but I used Irish Spring soap recommended by Julie at Cookiecrumbstoliveby blog. Julie also has deer visiting her beautiful garden. Check out her post! Julie has a beautiful vegetable garden and has been working hard in her garden, too hard to have the deer take it from her! If you want to read about how I prepared the soil and planted my grapes, read my post from last year, Growing Seedless Grapes. Our youngest grandson is almost 12 months old and he loves grapes. We have to peel them right now because the skin is too tough for me him to eat right now. He will eat a big handful in a minute! Do you grow grapes? What types of grapes do you grow or enjoy eating? These are my Oriental Lilies that I purchased in December last year. The oriental lilies have the most wonderful fragrance and it is one of my favorites! The fragrance is very sweet and if you plant oriental lilies you need to plant them near your deck or door way, bedroom windows so that you can savor their fragrance every possible moment! In January 2014 when I received the lily bulbs I posted Growing Oriental Lily Bulbs. If you would like to learn more about the bulbs and growing these read my old post. Oriental lilies are easy to grow with big rewards when they bloom. My wife really loves the colors of the Stargazer! Oriental lilies are great for flower arrangements. Debbie has made several flower arrangements and placed them throughout the house! I am thinking about installing a pond with a waterfall, so today I visited my local nursery. This nursery has several ponds full of water lilies, gold fish and koi. Today must have been the right time to visit because a good many of the water lilies were blooming. There were a lot of beautiful flowers so I wanted to share a few pictures. Not sure if I will install a pond or not, trying to determine cost and if I will have time to take care of it and the fish. My other problem will be figuring out how to keep all of our wildlife out of the pond and from eating all the fish. The flowers sure are beautiful! I hope you enjoyed these flowers are much as I did! Do you have a pond? How much work is it to manage? I have been really busy making cutting boards, serving boards, and custom woodwork for special wedding gifts. I have gotten a good many orders for wedding gifts. It seems that the round walnut cutting board in all three sizes is the most popular at the moment. This year I was fortunate to buy a large amount of beautiful walnut 1 inch thick, random widths and lengths. This walnut is beautiful with colors ranging from light to dark and includes some black streaking. A good friend of mind gives everyone he knows getting married the same wedding gift. On the day of the wedding he buys a new cooler and fills it with water bottles, sodas, beer, wine, champagne and ice. Along with the cooler full of drinks he also gives one of my cutting boards. The bride and groom always love the cutting board and the cooler full of drinks, especially if they can take the cooler with them on their first night together! 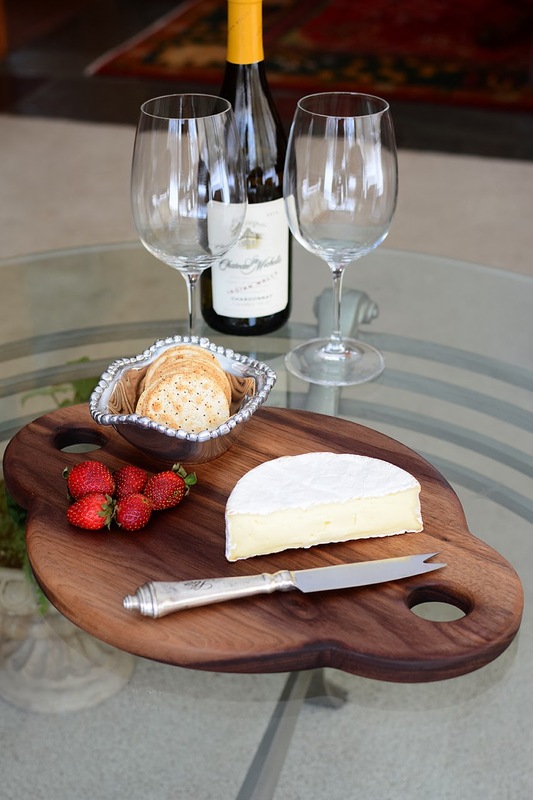 Cutting boards are very popular with people looking for a special handcrafted gift. All of my work is handmade so they become an instant heirloom and will last forever. With each order I always send along my Wood Conditioner and instructions on how to take care of the board. My Wood Conditioner is also handmade using food grade mineral oil and food grade beeswax packaged in tins and will help keep the board looking good. Today I shipped these three boards directly to the bride and groom in Pittsburgh, PA for someone who ordered the boards as a wedding gift. Nice surprise, I wish I could be there when they open the package. To see more about my handmade cutting and serving boards cutting boards pages.